In our third bout of the year we take on arch rivals Hot Wheel Roller Derby! 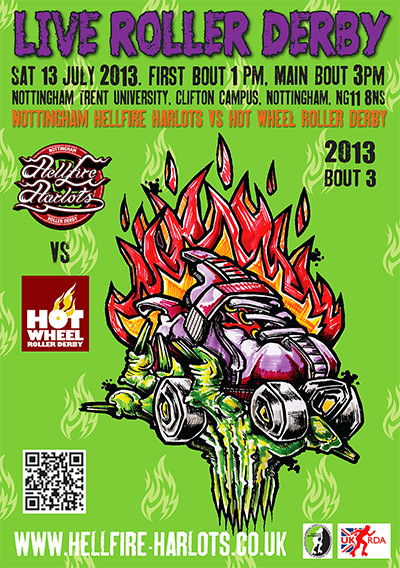 The Hellfire Harlots first took on Hotwheel in their first ever bout in 2011 clinching a narrow win. In 2012 those hard working hotties triumphed over the harlots on their home turf. Best of 3? Hell yes. It’s all to play for this time. Who will come out on top in this epic grudge match? Only one way to find out. And if that wasn’t enough, the men are getting in on the action in a mixed bout featuring male skaters from around the country.